The “Blog” of “Unnecessary” Quotation Marks: some kind of "code"
I think there is an intricate code at work here. Or there are some dogs slacking off near a window, and they would like you to not chat so loudly. Thanks, Matt. The most egregious part of the post is that somebody didn't get the memo that Comic Sans is the font of the devil. What is going on in the minds of people who write these when they read properly punctuated text? Do they simply experience all enquoted words as the equivalent of italicized block capitals in bold? By "people," obviously they mean "aliens." This one gives me a headache. AND if you understand the message and follow it, they will be "grateful"
I laughed so hard that I fell over, and in laughing horizontally, started choking. 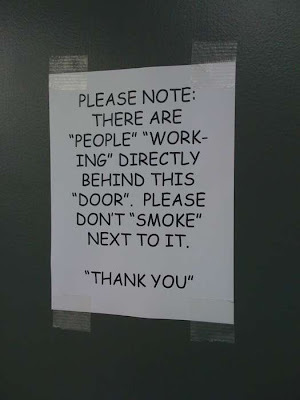 It makes you wonder what exactly they meant by "working", too. The "door" must be a movable wall, and "smoking" gassing them so they pass out, and you can go inside and take pictures of them!